The Star Trek Discovery Blu Ray is the complete first season and set 10 years before Kirk, Spock and the Enterprise. 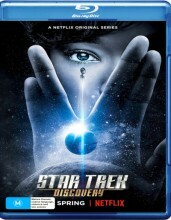 The Star Trek Discovery season 1 Blu Ray sees The USS Discovery discover new worlds and lifeforms as one Starfleet officer learns to understand all things alien. The Star Trek: Discovery Blu Ray is the new 2017 season which stars Jason Isaacs, Michelle Yeoh, Doug Jones and Shazad Latif. The Star Trek: Discovery season 1 Blu Ray is set roughly ten years before the events of Star Trek: The Original Series. The show sees the Klingon T'Kuvma look to unite the 24 great Klingon houses, leading to a cold war between his race and the United Federation of Planets that involves the crew of the USS Discovery. Click the button below to add the Star Trek: Discovery - Complete Series 1 (Blu Ray) to your wish list.